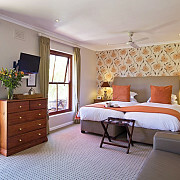 Three rooms decorated in warm neutral tones,each has a king-size bed or twin beds (extra length), desk/dressing table and couch, en-suite bathroom with shower, bathrobes and complimentary bath products. 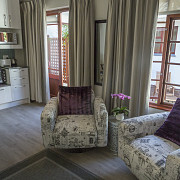 Free wireless internet connection, Satellite TV, hairdryer, safe, small fridge and tea and coffee making facilities are also provided. 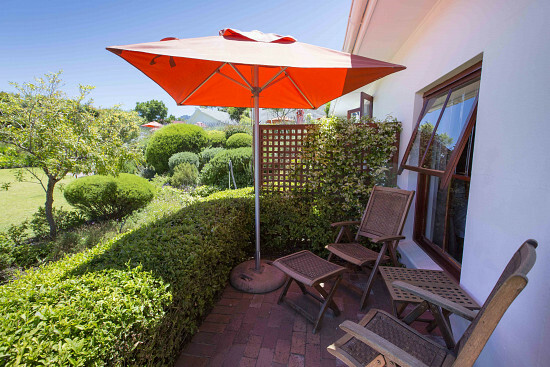 Each has a private entrance & patio with table and chairs offering great views of the Constantiaberg Mountains. 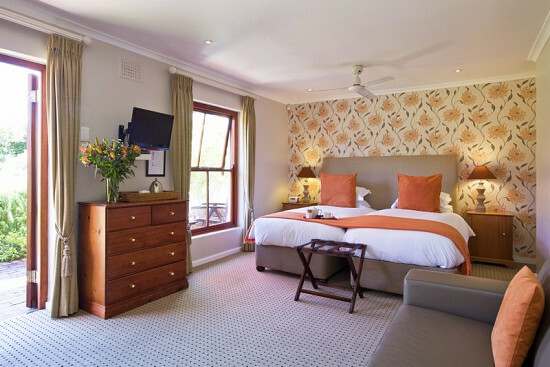 This elegantly appointed room is situated in the main house and does not have an outside area, it can be configured either as a king bed or two single beds (extra length). 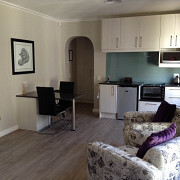 It also has a desk/dressing table and seating. 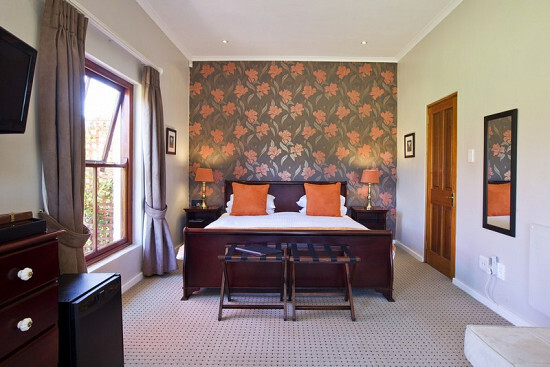 The private bathroom has a bath, shower, bathrobes, and complimentary bath products. 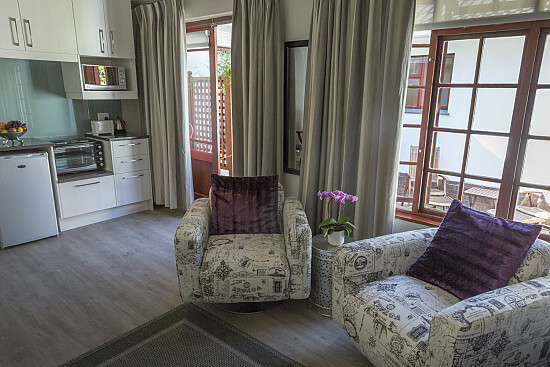 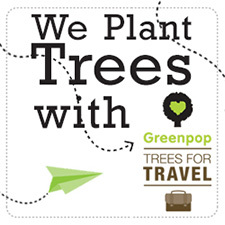 Free wireless internet connection, Satellite TV, hairdryer, ceiling fan, heater/air conditioning, safe, small fridge and tea and coffee making facilities are also provided. 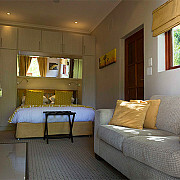 This room can be linked to the suite through an inter leading door creating a two bedroom, two bathroom, family suite. 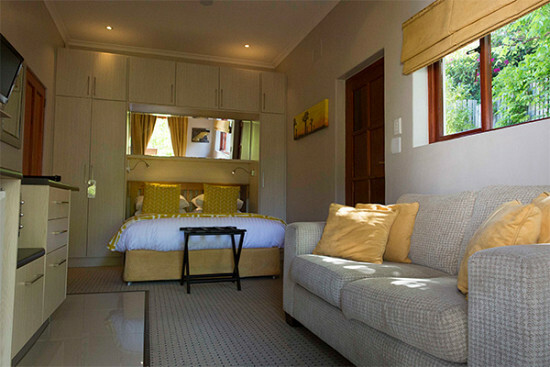 It can also be sold separately as a private room. 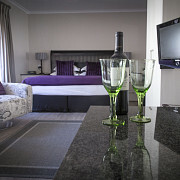 The suite has a large lounge consisting of a double sleeper couch and two armchairs with a kitchenette containing a ceramic hob, sink, fridge, microwave, toaster, crockery and cutlery with a four seater dining area, private entrance and a small patio with a four seater table and chairs. 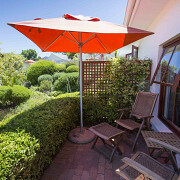 Free wireless internet connection, as well as 42" Plasma Satellite TV are provided. 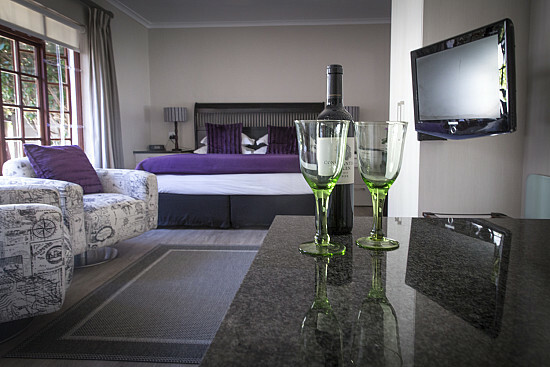 The suite can be linked to the Inside twin/king en suite room, through interleading doors, creating a 2 bedroomed private apartment. 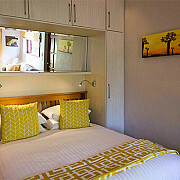 The apartment could sleep 4 to 6 perfect for a family holiday or for a long staying couple who want to entertain occasionally or selfcater. 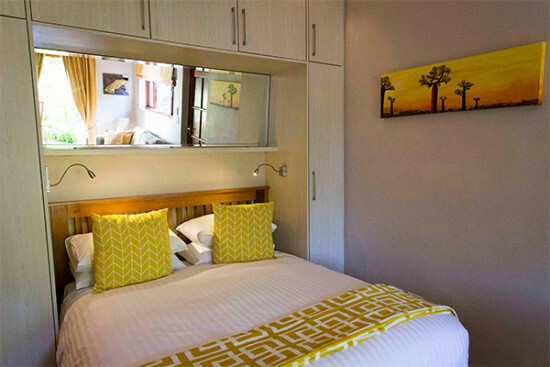 This newly created compact room, is perfect for the businessman or single traveller. 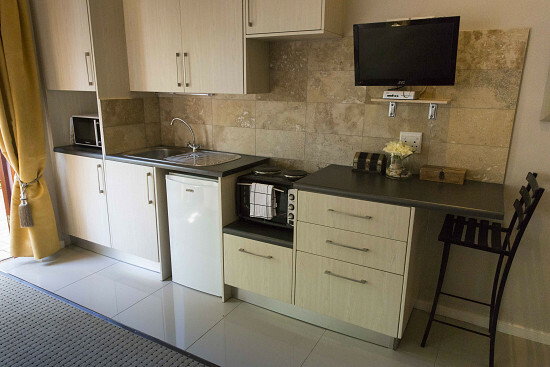 It has a queen size bed, kitchenette (cooker, microwave, fridge, kettle, toaster, sink, etc. 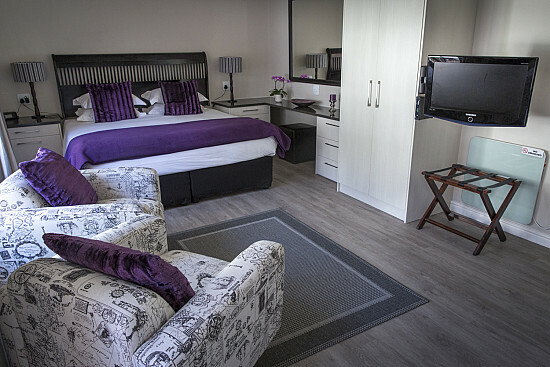 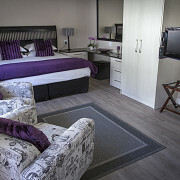 ), small eating area, good wardrobe space, en-suite bathroom with shower, bathrobes and complimentary bath products. 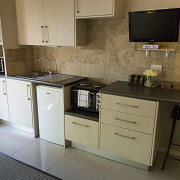 Air conditioning/heater, ceiling fan, free wireless internet connection, Satellite LCD TV, hairdryer and safe are also provided. 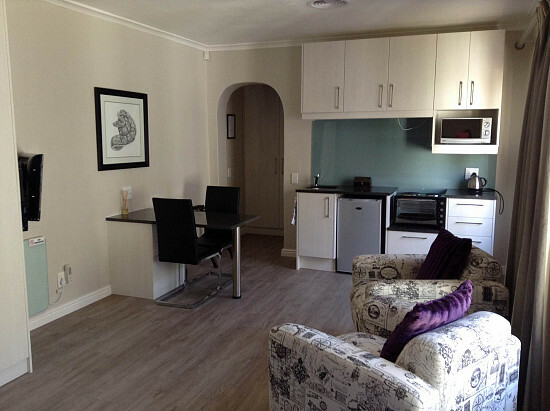 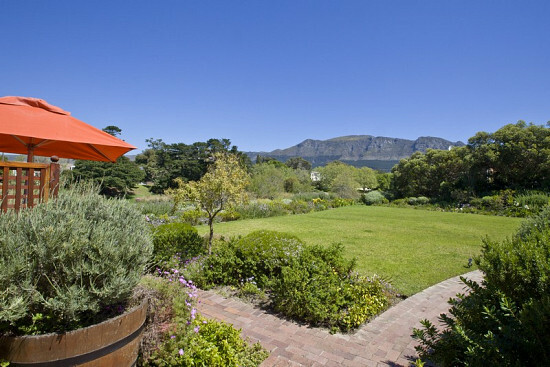 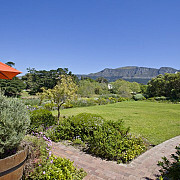 It has a private entrance & a patio with table and chairs offering a view across the green belt to Muizenberg Mountain. 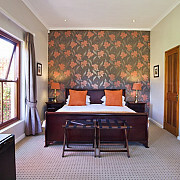 This room is very private and cosy, but as it is a smaller room, may not be suitable for long staying couples.